At a recent race meeting I was talking to a fellow competitor who’s son had just returned from a visit to the Nurburgring racetrack in Germany. The ‘Ring’ sees an endless pilgrimage to its challenging 14-mile circuit that is open to the public on a pay and go basis. His son’s visit included a tour of the track in a Jaguar and it was apparent from this brand experience that he had been converted into a Jaguar enthusiast and ambassador. This type of experience is not unusual as Porsche and other manufacturers use the circuit all the time to show off their performance prowess. Our conversation moved on to how this type of experience could benefit car showrooms as a whole, which got me thinking about the current state of the experience when buying a new car. It depends on who you are talking to but one of the most amazing auto experiences has to be the test track on the roof of the Lingotto building in Turin, but to be fair not everybody has that sort of facility and I can’t see health and safety waving that one through! So what sort of experience can customers get excited about? Porsche have opened a new showroom near our office in Dubai on the Sheikh Zayed Road. The three floors cover 5ksqm, offering the Porsche drivers an experience which includes a roof top terrace, a digitalization concept that delivers key information on demand a museum corner, boutique, café and racing simulator. Impressive stuff for one building but they are not alone in driving home the wow factor. Mercedes World situated in the middle of the old Brooklands track in Surrey, is a real hands-on experience that has its own track and brand centre. Mercedes also have some superb showrooms in Munich, which feature iconic racing cars including classics and the latest F1 car. We particularly like the coloured speed effect light wall, but visually exciting and informative showrooms are not only the domain of top end brands. While some mainstream manufacturers are predictable and rather cold, It would be unfair not to mention some impressive ones like Tesla in California, Lexus and Nissan in Tokyo and of course city centre experiences like Audi in Regent street and Peugeot, Citroen, Renault in the Champs Elyse, Paris. For me top of the list of mainstream experiences has to be Mini. Whist I am not a fan of the new models (I used to rally the original Cooper S’s) their showrooms bring an explosion of colour to what can sometimes be seen as a world of teutonic chrome and grey. 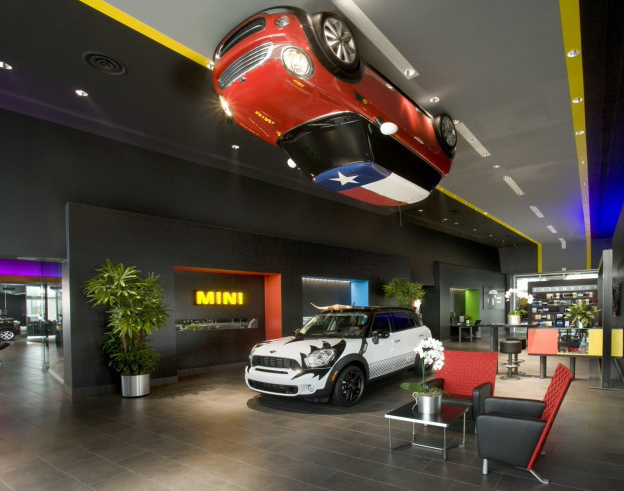 From new showrooms in London to Mini Centres in Berlin, their signature piece is mounting a Mini on the wall or fascia wherever they can, add to this the ‘in-your-face’ use of colour and the effect is automotive eye-candy. So for me the best experience has to be a well-balanced mix of heritage, racing supremacy, technical excellence, great design and reliable performance. As for price, well you get what you pay for and as with all products and services the ‘unattainable triangle’ of price, quality and availability still stands – you can’t have everything in equal portions. If that lager brand did car showrooms it would feature a great heritage museum featuring gob-smacking race cars, race and off road or rally simulator, an automotive education centre, a café with walls full of interesting auto jumble, car club enthusiasts corner, a reason to believe section and of course a full range of product with ‘easy-to-get’ options selection. The Automotive Junkies alternative to a Health Spa! 03/12 - Branch Transformation: Do you really need a branch of the future? And does it have to be a Ferrari?